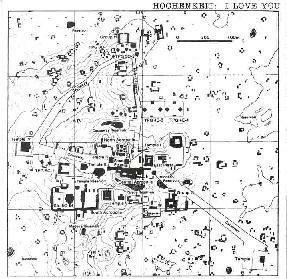 Hochenkeit - "I Love You"
Hochenkeit is a Portland, OR instrumental quartet that plays a droning, valium-paced blend of Krautrock and Middle Eastern psychedelia. I'm unclear on the members, but the instrumentation includes harmonium, guitar, cumbus (a Turkish banjo), drums, percussion, bass, and theremin. The album is a mixed bag of somewhat interesting acoustic drones and damn good avant-garde Krautrock. For example, "Ritual Nacirema" features a slowly phased drone playing in the background while two or three acoustic instruments slowly pick and strum. A trippy twangy guitar picks out snake charmer melodies and the combination of the multiple acoustic instruments played over the drone has an eerie and interesting sound. Block percussion plays at the same drugged pace, banging and clacking out simple rhythms. Similar to this is "Frightening Diaspora, Drifting Cranes", which made me think of Philip Glass minimalism, but with more elements to the music than Glass would include. Things don't start getting interesting though until five minutes into the track when a ghostly synth begins to play over the throbbing drone pattern. This is standard to the Hochenkeit sound and while it held my attention I don't feel compelled to go back and listen to them too many times. But Hochenkeit clearly have the stuff it takes to make exciting music. "Help Me / Help You" sees the band exploring freakier Krautrock territory. Bubbling and wailing synths, slowly pulsating guitar notes, and generally tripped out controlled chaos are the order of the day here. These guys like to take things slow as the pace is pretty much the same as on the other tracks. But this track would indicate these guys have interests in truly exploratory spacerock like Amon Düül and related pioneers. But my favorite track on the disc is "Smokin' The Astronaut", in which the band journeys into even freakier territory. The song starts as a purely electronic piece. This was a bit jarring as I was listening with headphones and these pulsating tones at the beginning kept jumping from hard left to hard right. But the music develops into a really cool early 70's Krautrock, or general heavy rock, influenced jam. This is the closest Hochenkeit comes to sounding like a full band with a real rhythm section. But over the jam is heavy wind whistling synth patterns and squeals that create a creepy atmosphere. The tension builds slowly and powerfully, only to end abruptly while I was tripping along with the music. A potent track. Finally, "A Roomful Of Sun" is an electronic exploration that develops slowly but smoothly creating some interesting patterns and sounds. The simple acoustic and percussion bits that have been a trademark of the Hochenkeit sound on this disc succeed on this track as components that embellish the electronic textures instead of dominating the music, a feature of Hochenkeit's music that didn't always grab me. Ok, so there are three of nine tracks that I thought were really good. Overall, I found this album to be a bit hit and miss, but the good tracks are solid proving Hochenkeit to be a band with potential. I suppose hearing what styles are repeated on the new album scheduled for Spring 2000 will show where Hochenkeit's interests lie. For more information you can visit Hochenkeit at the Roadcone web site where you'll also find sound files.